(Views from the Wife is exactly as it sounds – these a reviews done by fellow movie-lover and coincidentally my wife). The opening of this film is very poignant and depicts the literal creation of what has become the iconic doll. The doll maker is shown lovingly making and building a doll, carefully painting its features, thus implying that the doll come from a place of love. An important concept, which one will do well to remember throughout the film, as the film is ultimately an origin film. The premise of the film is that a couple tragically lose their daughter, and years later, open up their home to orphaned girls and their guardian, a Catholic Nun. Characters are built well. From the outset, viewers are encouraged to feel sorry for main character Janice. We are informed that she had suffered with polio and struggles to walk. She is ostracised from the main group of girls. She is depicted as weak – an obvious candidate in a horror film to be the victim. The film does acknowledge this, as the Nun does make a point of saying to Janice, ‘the devil preys on those who are weak in faith, not weak in bone’. The film embodies much generic iconography we have come to expect of the horror genre – flickering of lights, forbidden locked room, isolated creepy house, rocking chairs, creepy music and the list continues. As a horror fan, it is quite comforting to watch a film which uses these familiar concepts, however, I felt I wanted more of the unexpected and unpredictable in here also, which I believe this film lacked. Another prevalent theme which is consistent with the horror film genre is that the ‘bad guy’ will not die. Take for example, Michael Myers in Halloween (1978) and Freddie Kruger in A Nightmare on Elm Street (1984). No matter how many times they are ‘killed’, they consistently return. And this film did not disappoint in this respect. The doll is thrown down the well (all I could do was think of The Ring (2002)), and yet, appears in Janice’s place – a nod to tell the viewer that evil has taken Janice’s place. Religion within a horror film is nothing new, especially within the sub-genre of possession and demons, but it was used well here. It is a method which enables the viewer to clearly recognise good vs evil. The typical iconography of crucifixes, crosses and pages from the Bible were all utilised effectively. The film did not always follow the typical ‘rules’, whereby these objects and what they symbolise should help to hinder and defeat the demon. The demon rebelled against this, exerting its power, for example when the Dad showed the crucifix to the ‘the demon’, his fingers were bent right back and broken by an invisible force. It did not have the intended effect of deterring the demon. The depiction of ‘evil’ I felt was sometimes quite generic – the presentation in the ‘little girl’, the black smog, the use of a back oil-like liquid to transfer evil from one being to another. Even the depiction of the demon itself felt generic. I felt as though, just like in Mama (2013), somethings have greater impact and are stronger when left to the viewer’s imaginations. Having a clear view of the demon removed the scares for me. Overall, I did enjoy this film. I felt it failed slightly as a horror film as it did not succeed in scaring me. 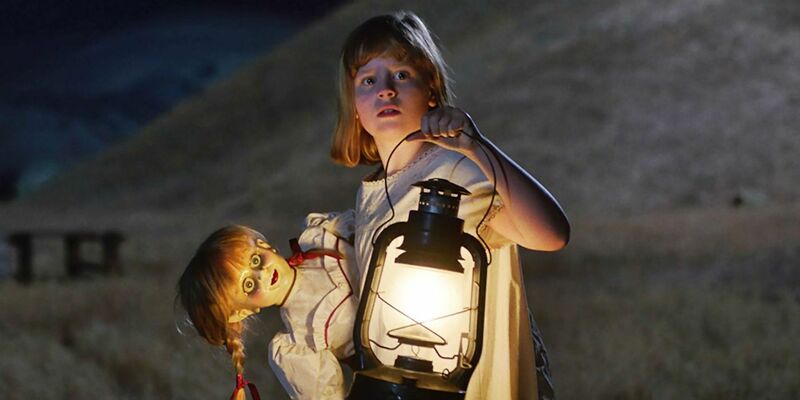 Its predecessors were more successful in doing this – The Conjuring (2013) left psychological scares (the scene with the girls in bed has stayed with me even years after watching it) and Annabelle (2014) was filled with ‘jump scares’. I felt that, although it kept my attention, this film could be forgettable with no one scene impacting on me. I did, however, enjoy how towards the end of the film, it linked to its predecessors. 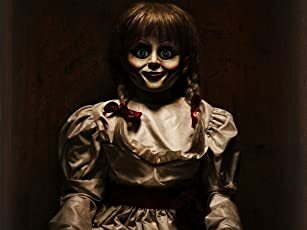 As it is deemed to be an origin story, I felt this was important and it did succeed in making me want to revisit The Conjuring and Annabelle to see how exactly they all intertwine. Throughout the franchise, I feel as though the iconic doll has quite literally lost its powers too. 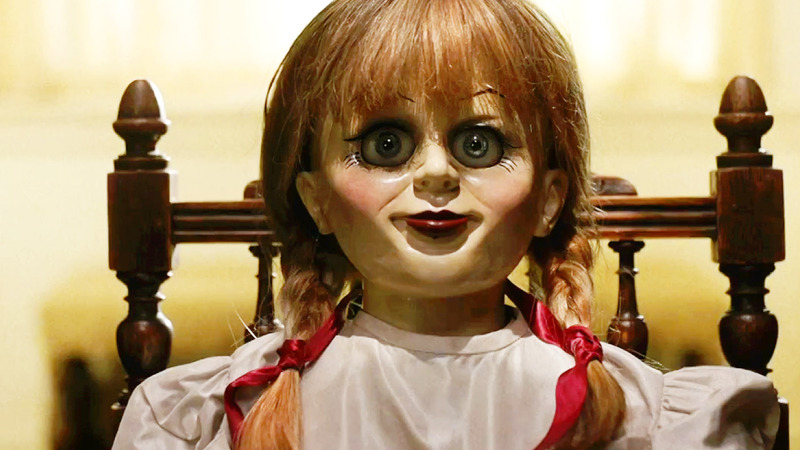 I remember watching The Conjuring and being really creeped out by this doll. It felt so haunting, the way it stares with those huge, striking eyes. The fact that it had to be kept locked away in the glass cabinet because it was considered so evil only added to the sense of danger. It saddens me to say that I did not feel the same way about the doll in this film. It’s as if I, over the course of the three films, have had almost too much exposure to this doll and so it does not creep me out as much as it once did. Previous Previous post: Then and Now Month: The Launch! Next Next post: Has Stranger Things given us the perfect cast for a Last of Us movie?